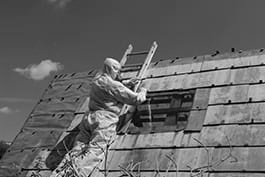 Asbestos removal workers remove asbestos from buildings and facilities. Prepare work sites, e.g. erect barriers and scaffolding. Select or request equipment and machines, transport and set them up. Locate the indentified asbestos that needs to be removed, e.g. using monitoring devices. Wear respirators for protection from dangerous airborne particles and suits that completely protect from hazardous materials (e.g. disposable or reusable overalls, gloves, hardhats, shoe covers, safety glasses or goggles, chemical-resistant clothing, face shields and devices to protect hearing). Perform demolition and deconstruction work. Remove asbestos from the surfaces of walls and structures, using various hand and power tools (e.g. vacuums and scrapers). Package, transport and dispose of asbestos in a safe manner. Respond to accidents and emergencies, and clean up after accidents. The legislation and regulations surrounding the removal of asbestos contamination from buildings or structures, the safe removal of contaminated materials and the regulations to avoid and prevent contamination.